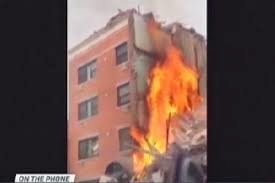 Flames and smoke were sent billowing into the air after an explosion leveled two buildings in East Harlem Wednesday, killing one person and injuring more than a dozen others. It happened around 9:15 a.m. on Park Avenue on 116th Street, the FDNY said. One of the buildings that collapsed had a piano repair shop with apartments above. The second building housed a church. The cause of the blast is still unclear, but Con Edison said crews were responding to the area on a report of a gas odor just prior to the explosion.